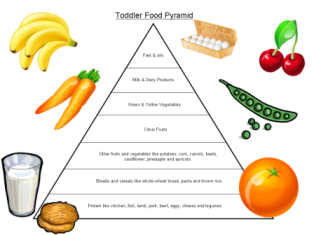 It is helpful to have a toddler food pyramid in your kitchen for planning your toddlers meals. Here is a printable version for you to stick up. When reading this diagram you will see that the largest block (i.e. at the bottom) is the food group that your toddler must eat the most of working up the pyramid until fats and oils which they should have the least of. Click here to download your toddler food pyramid.